This is a co rrect octagon, each side of which has the trigram. There is a legend that the order of the trigrams was sent by the gods on the back of a huge turtle that crawled ashore more than two thousand years ago. A great sage Fu Xi, could understand the message and decrypt the trigrams. In accordance with the teachings of Feng Shui, everything that happens in our life can be divided into nine life aspects or categories. All these aspects of life, united together in a certain order, form a map of Ba Gua. All nine zones are equal in magnitude and are responsible for a specific area of life - wealth, fame, health, love, etc. There is an opinion, that it is not necessary to adhere strictly a system of Ba Gua, but it is a wrong statement. It's important to remember that the purposeful design of the zones with the orientation on the map of Ba Gua, is increasing the beneficial effect of the "Qi" energy in the room on the appropriate areas of your life. Another thing is that it is hard to imagine Feng Shui without creativity. This ancient science is giving a great start to the creative principle. Now people are able to create their own lives by their own hands. And Ba Gua helps you to consider exactly those areas of your life that matter most to you. With the help of a compass find out, where is North. Divide the plan of the apartment or house into nine equal parts. Align the compass north with the north on the plan. You will find yourself in the sector of Career. In the South you will find a sector of Fame. It is officially called this way, although it is also responsible for the success in life, achieving popularity and moving up by the career ladder. There should be noted a little surprise that many people are finding, when imposing the Ba Gua map on the plan of the apartment. This surprise is presented by the architects, and consists in the absence or a weak expression of the particular zone. But do not fall in despair, there are many different techniques of Feng Shui, that are able to help people to cope with this situation. There are some certain methods of correction in case some zones are absent. If the layout of your apartment does not allow you to arrange correctly all nine sectors of the Ba Gua, you have a right to increase their energy in the other sectors of the house. We will talk about each of them separately. 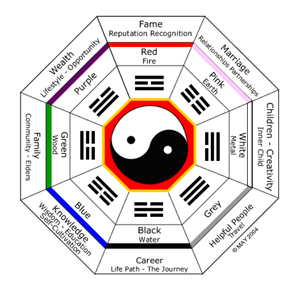 But do not forget that everything in the world is interconnected, the essence of Feng Shui is to provide you with the complete harmony in your life.